For the English cricketer, see Barbara Murrey. 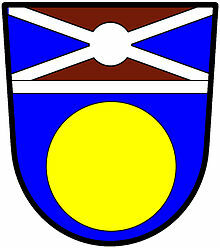 Murrey is used on these de Jong arms: Azure, a bezant; a chief per saltire, murrey and azure, filleted argent, over the partition a fillet saltire nowy, also argent. The name of the heraldic stain of murrey derives from the name of the mulberry, which is the fruit of the tree Morus nigra whose reddish purple colour murrey originally represented. In heraldry, murrey is a "stain", i. e. a non-standard tincture, that is a dark reddish purple colour. It is most proximate in appearance to the heraldic tincture of purpure, but is distinct therefrom. 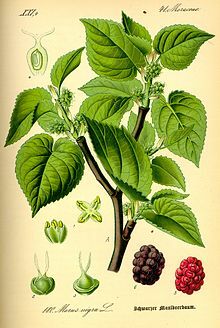 According to dictionaries, "murrey" is the colour of mulberries, being somewhere between the heraldic tinctures of gules (red) and purpure (purple), and almost maroon; but examples registered in Canada and Scotland display it as a reddish brown. The livery colours of the House of York in England in the fifteenth century were azure and murrey, as depicted on the shields of the Falcon of the Plantagenets and the White Lion of Mortimer, which are 2 of the Queen's Beasts. ^ Heraldic dictionary at Flags of the World. Accessed 14 July 2009. ^ Crest of William Dale Murray: "Issuant from an antique crown or a bison's head in trian aspect murrey accorné or." Canadian Public Register, Volume 4, page 292. ^ Arms of ____ Brown: "Murrey; a chevron between two fleurs de lys in chief and a plough in base, or." Public Register, Volume 71, page 26. ^ H.Stanford London. The Queen's Beasts. Newman Neame Ltd. pp. 25–33.